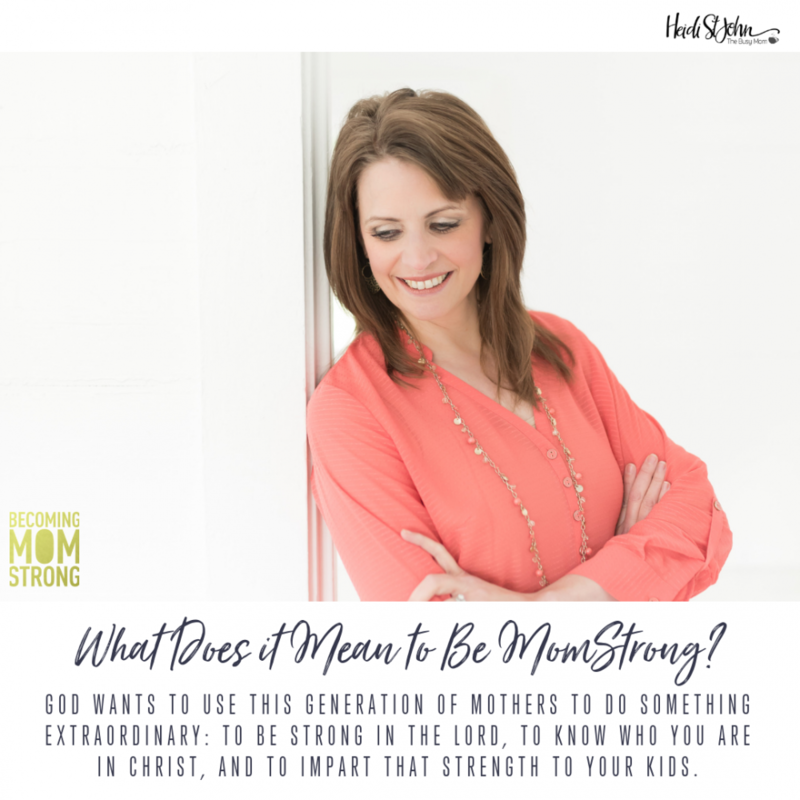 What Does it Mean to Be MomStrong? Have you ever looked into the faces of the people who call you mom and wondered what in the world you got yourself into? Do you ever feel weak and unqualified for the position that is often referred as “a sacred calling”? Have you ever wished you could transport yourself and your kids back to a simpler time—a time when schools taught math and reading, there was no such thing as the Internet, and churches taught the truth? If you’re like me, you’ve been reading the headlines and watching the rapid-fire changes that are taking place in our culture with a fair degree of frustration and fear. Let’s face it: moms today are being asked to deal with more than just the “basics” of motherhood; we’re grappling with questions that previous generations never even saw coming. We’re constantly assaulted by questions about everything from gender identity to the safety of vaccines. Today’s mothers need a special kind of strength. Yes, we need to be physically strong, but we also need strength of conviction and spiritual fortitude. Today’s moms need to be strong in the Lord and in the power of His might. We dare not rely on human strength for the current battles we’re facing in culture. The schools will tell you that they know better than you do. Don’t believe them. The media will tell you that truth is whatever anyone wants it to be and that the role of parents isn’t that important. Don’t buy it. Voices from your past might whisper, You’re not ready for this. Don’t listen. You can do this! You—the mom in the midst of it all—have been set apart for a job that only you can do: to train your children to hear God’s voice and to walk in the truth no matter where our culture is heading. You might be tempted to shrink back from the challenge or let someone you think is smarter or stronger than you take over. But I want to encourage you—for the sake of your children—to engage in the battle. It’s no accident that you’re here right now. This is a special generation of mothers who has been called to shepherd a special generation of children. God wants to use this generation of mothers to do something extraordinary: to be strong in the Lord, to know who you are in Christ, and to impart that strength to your kids. In other words, He wants you to be MomStrong! Make no mistake: motherhood is tough, and it’s not for the faint of heart. In my twenty-six years of parenting our seven children, I’ve learned how weak I can be and how strong God is. I’ve come to believe that God wants to use my role as a mother to give me a glimpse into His Father-heart for all His children. After all, He knows I’m going to need it for the mission I’m on with my own kids. And yes, whether you’re aware of it or not, if you’re a mom, you do have a mission—to raise the next generation of teachers, doctors, judges, police officers, grocery store clerks, attorneys, and nurses. Truly, the hand that rocks the cradle rules the world. But wait—there’s more. 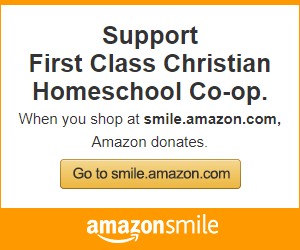 You are also raising the next generation of parents! Look around. It doesn’t take long for one generation to hand the baton to the next. And it’s up to you, Mom, to make sure that when the time comes, your children are strong enough in the Lord to accept the challenge themselves. What a high calling motherhood is! Our culture may have reduced it to little more than a stopover on the way to something else, but the truth is that motherhood is sacred. You, Mom, are shaping the future, one little heart at a time. Everything else pales in comparison. If you aren’t sure where to get the strength you’ll need for the journey, keep reading, because this beautifully broken mother of seven would like to give you a gentle hug and a high-five as I point you to the true wellspring of life and strength: Jesus. By the way, it’s okay if you don’t feel strong. None of us start out strong. The good news is that God doesn’t require strength for the journey; He offers it. He wants to make us strong, but we have to truly want His strength in order to find it. How do we want it? By acknowledging our own weakness. It may feel a little frightening at first, this admission of weakness. But take it from someone who has been there: coming to terms with weakness is liberating. When we finally admit we can’t do it on our own and look to Jesus, we’re about to be set free. Free from the past. Free from the tyranny of other people’s expectations. Free from worry. Free to love. Free to grow. Free to move with confidence into the future. Exchanging our past for a future in Christ and claiming His strength is where becoming MomStrong begins. In Christ, you are more than a conqueror. You are strong, safe, sealed, and secure. You are a channel of the love and life of God for your children. So where do we start? How can we stand up and be strong in a culture that marginalizes mothers and puts children at risk by its very definition of family? We go back to the beginning. God has already given us the blueprint for becoming MomStrong, and that blueprint is found in the Bible. He has entrusted us with bringing up the next generation, and He says that His strength is made perfect in weakness. It doesn’t matter where you started. Your inexperience makes you the perfect candidate to receive direction from the One who knows your kids better than you do. Your past doesn’t need to define your future. God is in the business of redemption! He makes things new. Strength comes from Him. By God’s grace, we can be strong enough to show the next generation that we serve a mighty God. 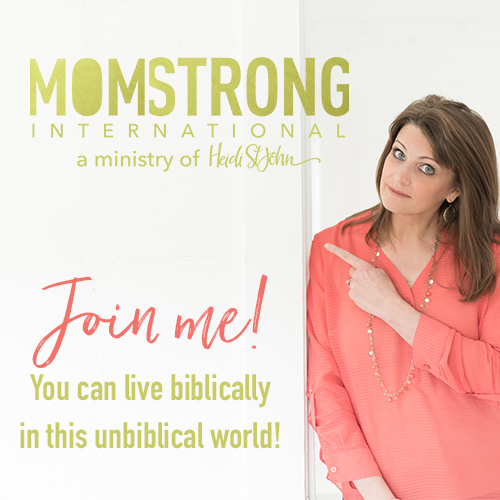 By God’s grace, we can all become MomStrong! Love these words. I want to be Mom Strong for my 3 kiddos! Wow. So true. Moms today are bombarded with challenges and then told by culture that it is better suited to handle kids than parents are. You are so right we must be strong and say Not with my Kids you don’t! This was like a hug from the Lord this morning as I sit here feeling broken and completely inadequate to parent. Finding out our teenage daughter is cutting herself yesterday and feeling so broken and helpless and wondering how God can ever help us make this right and use it for His glory. But like you said, we have to be in the battle even when we’d rather hide. We have to fight for our kids and stand in the gap for them. I am committed to fighting for my daughter’s life and being Mom Strong. Thank you for your faithfulness in writing what God lays on your heart and sharing it with us. It does make a difference. Oh Christy, I am so sorry. That is such heavy news for your mama heart to bear. Do fight for your daughter in truth and love, but also remember to commit her to our Father’s hands. As a former cutter who is currently becoming MomStrong herself, I just want to encourage you to trust that there is nothing that God can’t redeem and make whole again. We serve a great and mighty God who cherishes His Children! Love to you in Christ and I will be praying for you all!